Troop 50’s annual end-of-the-spring court of honor on Sunday, June 3, celebrated the scenes and flavors of summer as Scouts, leaders and families gathered at the Moore’s Mill Neighborhood Pool for an afternoon event that included an ice cream sundae bar and a dip in the pool. The event was not all play, as the troop had some serious business to attend to — namely, electing its summer/fall youth leaders and the recognizing several Scouts for their advancement efforts. Patrol Leader Olen, Assistant Senior Patrol Leader Jason, and Senior Patrol Leader Joe. was installed as a junior assistant scoutmaster. Webelos to the troop in April. First on the agenda were troop elections for senior patrol leader and patrol leaders. The slate of nominees included several long-serving and dedicated Scouts. Following campaign speeches by candidates and voting by the Scouts in attendance, the summer/fall cadre of elected leaders will include Joe, elected as senior patrol leader, and Camp and Olen, who were elected as patrol leaders. Additional appointments included Jason, who Joe selected as his assistant senior patrol leader. Also appointed as junior assistant scoutmasters were Liam, who was presented his Eagle Scout rank at a ceremony in May, and Jacob, who has completed his Eagle Scout Leadership Service Project and is expected to pass his board of review this summer. This court of honor cycle included 10 rank advancements (most of which were Scout ranks awarded to our newest Scouts) and 25 merit badges. It also include two Eagle Scout palms — a gold one for Louie and a silver one for Creighton. Scoutmaster Baird, which has come to indicate the troop's past senior patrol leaders. The final two items on the court of honor agenda included recognizing several Scouts for their exceptional achievement. This included outgoing Senior Patrol Leader Rusty, who Scoutmaster Andrew Baird presented with the traditional handmade neckerchief slide denoting those Scouts who have served in the troop’s top leadership position. who was unable to be present for the court of honor, will receive his recognition at a later date. Scoutmaster Baird also awarded this year’s Honor Scout Award. First presented in 2015, the James J. Baird Jr. 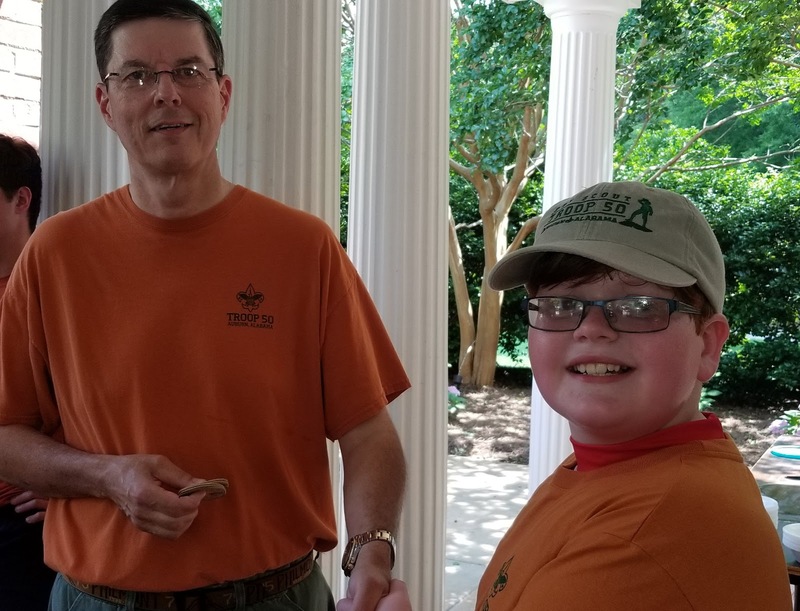 Honor Scout Award is bestowed annually to the troop's "top Scout" based on his participation in troop activities, demonstration of Scout skills, continuing advancement success, and a vote of his peers. The award honors the memory of Jim Baird, the uncle of Scoutmaster Baird, a 1945 recipient of the Eagle Scout rank and longtime Rotarian leader. Competition for this year’s award was steep, resulting in unprecedented co-winners — former senior patrol leaders Jacob and Creighton. The spring court of honor concludes the end of the troop’s regular school-year programming. Summer activities will include a contingent attending summer camp at Camp Daniel Boone in North Carolina, the troop’s annual “Chill at the Lake” summer family gathering, and the conclusion of the troop’s God and Life Protestant religious emblems program. The troop will resume its regular Monday-evening troop meetings on Monday, Aug. 6. Additional photos from the troop's spring court of honor are available on the troop's online photo album.